If you read my Meet Nicole page, then you know the story of why I know print is so important and unbeatable when it comes to your families most precious treasures of preserving it’s history through prints and albums. In such a digital age prints become less used and stories are lost in the ever-expanding cell phone, cloud or social spaces. I believe in the experience of print! When I went to print my wedding album, I wanted the best of the best. Doesn’t everyone? I actually spent weeks researching what company I wanted to go with to print these memories. I got to know the top companies for printers and album creators. The best part is, once I had mine and saw the quality that others had raved about from the album and print company I went with, I knew my own clients needed to have this quality too. I wanted the best and so I offer the best. Let's tell and keep your story, not just capture it, but experience it and hold it forever. To do that I take you beyond the passive screen and help you engage with your sense through tangibly reliving your memories. When working with me you will 100% have a tangible heirloom for your home and family to enjoy for generations. If you love details and want to read more on the science and why behind the quality of my printers blowing those average printers out of the water, view the section at the bottom on quality. Every print is made by my personal favorite and trusted professional full service printing lab. Each image is rich in color, quality, and finish. Using Luster coated paper, my prints include mounting to preserve the image for generations. Mounting your images makes sure that the print does not bend or warp, even when framed. (See more on the printing process below in my quality section for details of why professional quality is so unbeatable and beautiful compared to your local every day store). I offer individual canvas’ or pre selected gallery groupings/collages to purchase. I help you find what fits and works for your home. Each canvas gallery print is exquisite. They become a work of art and definitely a conversational piece in your home for you, your family and guests to enjoy. The canvas’ are painstakingly printed on artist's grade canvas, stretched around sturdy wood frames that stay taut and lay flat with super tight corners then lustre-coated for added protection and a sealed with backing that’s ready to hang. Durability, image clarity, and color accuracy are our top priority for canvas printing. The inks hold up over time without fading and preserves the fine details without over saturation of the colors. Every print is made by my personal favorite and trusted professional full service printing lab. Each image is rich in color, quality, and finish. Using Luster coated paper, my prints include mounting to preserve the image for generations. Mounting your images makes sure that the print does not bend or warp, even when framed. (See more on the printing process below in my quality section for details of why professional printers are unbeatable and so beautiful compared to your local every day store). Only the best for your best! 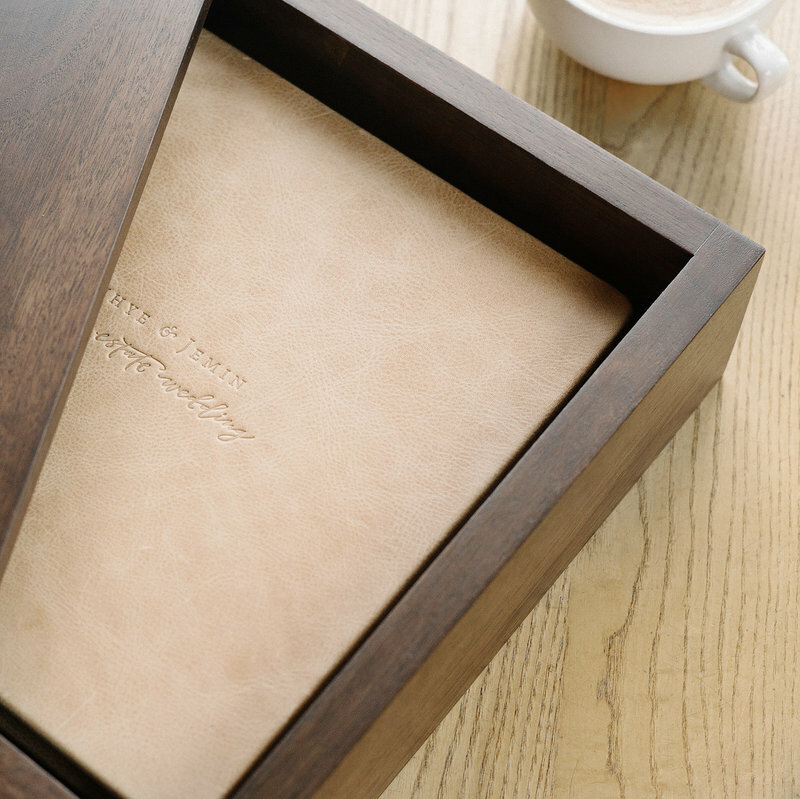 I hand selected my Portrait Heirloom Album provider that handcrafts each feature with professional grade and quality. Each album is built with a legacy in mind from design to paper, it is built to last. The pages are ultra thick, lay flat, are customizable with foil stamping and a variety of fabric colors to choose from for your cover. The “Fine Art Wedding Album” is gorgeous as you can see the quality in the photos… but even more beautiful incomparable in person. Each album is custom made meticulously by hand with care and precision. Once completed it goes through multiple stages of inspection to ensure that it is of high standard and excellence. Every page lays flat for you to easily see every photo creating a seamless view. The pages are think and sturdy preventing any bending and preserving your story in the most striking way. 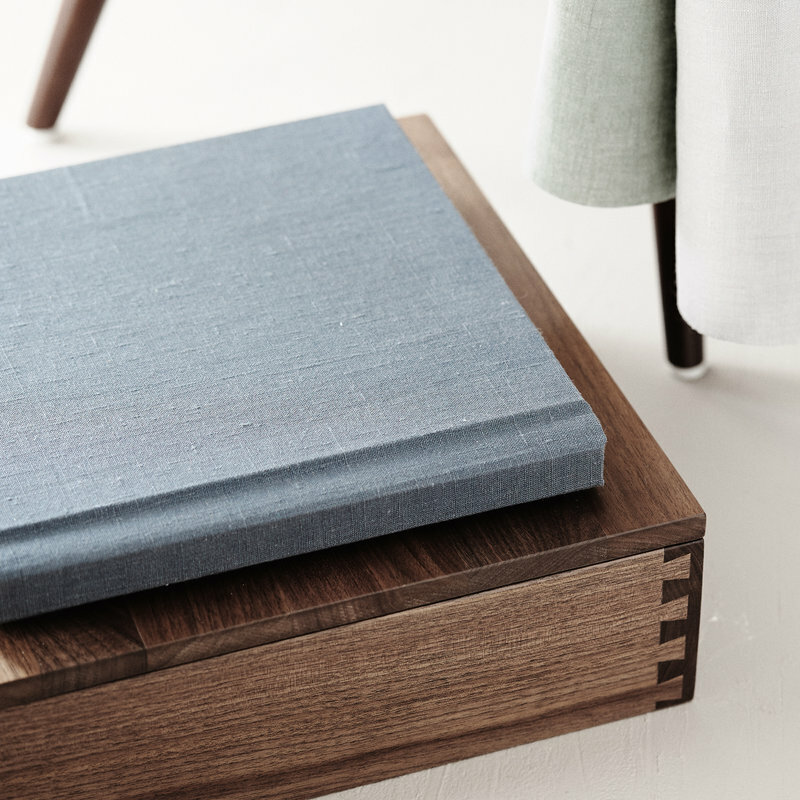 I support print so much that I include each collection with a linen album. The best part is you can add customized options to make it your own. 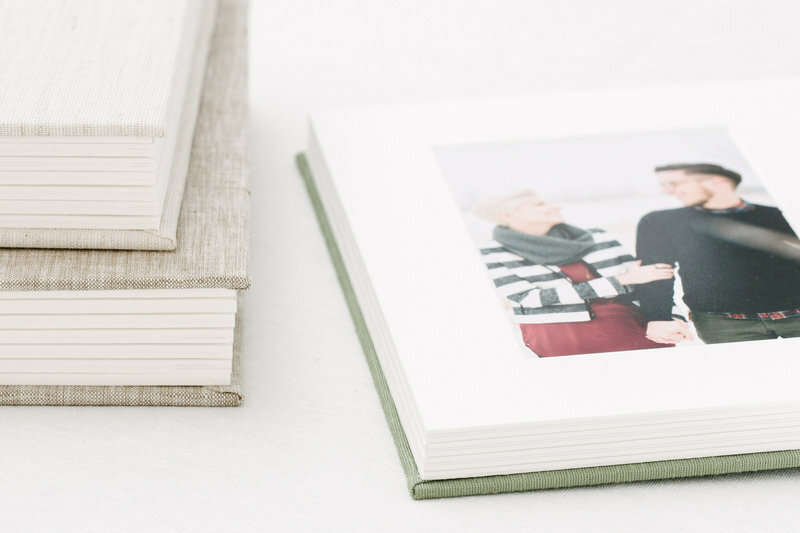 Things like debossing your name or wedding date to the cover, upgrading the material from fabric to leather, adding on a custom high quality hand made wooden box for storage, or sharing photos with your parents through their own mini album. It’s not just the album paper, binding and material that makes this special. I personally design your album with you to make the process simple, easy and smooth (see more about your “Peach Bride Experience” here). You get to walk away knowing you styled this album yourself. It has so much meaning not only in the pictures but in it’s craftsmanship and your personal touch. A true gift that is one of a kind and guaranteed for life, so you can relive your best day, everyday! The lab I use proudly prints with Fuji Film’s finest papers which is Fuji Lustre Crystal Archive. This paper has vivid color reproduction, brilliant whites, rich blacks and a semi-gloss luster finish.You receive prints that are vibrant, sharp, accurate and rich color , with full depth and detail. The paper has a longevity of 100 years when cared for and displayed in normal settings, making your work sure to last a lifetime. Each photographic print is created using a traditional silver halide process, where images are exposed onto light sensitive paper, just like processes from a traditional darkroom. A use of a laser admits the colors onto the paper. This process allows for printing to be more exact creating a better image, longer lasting and has the affect of bringing the image to life. Other drinking with the use of ink, like at your local every day store, spray the image on with the use of color cmyk onto the paper using an ink jet process. This doesn’t yield the same color effect, longevity and quality like a professional printing lab. At local stores you see the average machine that prints photos by the thousands. Within a professional printer your images are printed using machines that are warehouse size printed with quality and precision. Imagine being able to stand under or in one they are so large. When printing, each image is white balanced and viewed on a color calibrated monitor. The professional printer machines print based on printing color profile specified, which is called a ICC. This profile is carefully calibrated and dictates the color to be printed. The profiles used within a professional lab are different and set apart from any at home or local store ink jet printers. It blows them out of the water. Allowing for the most accurate colors and wide range of gamut in printing. I wanted to write this section on quality so that you could understand the difference between the print and album quality you will receive here vs. other printers. This is for those detailed nerds out there, that really want to understand the why and science behind all the raves. I actually did a quality comparison test myself in order to show each client the difference in the prints. You can ask in our planning meeting and I would be happy to share the comparison board I made just for you. You truly won’t get this kind of gorgeous high quality fine art printing from places like that. I provide the best for my clients. The prints you receive will be long lasting, won’t fade and will stand the test of time. First, this is not your Costco, Walgreens, Walmart, CVS, or Shutterfly printers. There are very specific reasons as to why. Some of top reasons are the paper, ink, color profile, and machinery. Below I jump into each area in more detail.